Every day after school Melvin goes to the library. Everything has its place in the library and Melvin likes it that way. And his favorite people–Marge, Betty, and Leola-are always in their places, behind the reference desk. Lucky librarians know a kid like this; luckier ones know several kids like this. There really isn’t anything more satisfying than seeing a kid who has used the library regularly –I mean really used its resources — grow up to become something special. I’ve had the pleasure of knowing several kids like that and when I’m doubting my choice of profession, thinking about these kids always brings me back around. There’s Karl Slominski, who was part of my very first young adult book discussion group back in 1996 and who, at age 13 created a full-sized wall mural in my old library and called it “The Stuff that Dreams Are Made Of.” Karl is now a successful graphic artist whose work can be see at Slomotion Art. Last I heard, he was working on storyboards for a new Edward Norton movie. Then there’s Kaylen Lott, who was part of my young adult volunteer group back in the late 1990’s and who is now doing graduate work in immunology at Upstate Medical Center in Syracuse. I remember Kaylen telling everyone she was going to save the world, and now she’s on the way to doing just that. 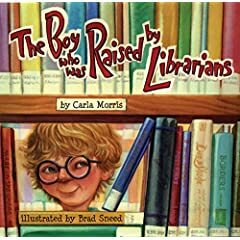 What I love so much about books like The Boy Who Was Raised By Librarians is that they do such a fabulous job of explaining what we do and how much of an effect we have on children. Now the real challenge is getting some of those kids whose lives we change in the positions of power that control the money. That’s why I love George Maziarz so much. Every time I see him, he tells the story of how he grew up right next door to the Tonawanda Public Library and how he spent so much of his childhood inside that building. And today, he is one of the strongest supporters of libraries in Albany. We need more like him. This post is also published on my library blog – Sources of Inspiration.